I'm very excited about the new catalog that I have in my hands in 36 hours. I can't wait to see all the new accessories and stamp sets. The whole convention experience puts all the demonstrators on a high for months. This year is extra special because it is the 20Th Anniversary of Stampin'Up. 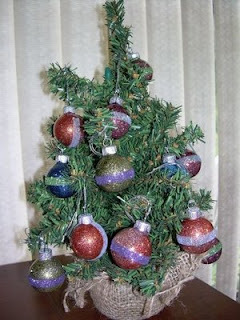 So I'm off to celebrate with the ornaments shown on the Christmas tree. They represent one of the items I'm taking with me to swap with other demonstrators. Time is drawing to a close for the existing catty. Take one more look through to make sure that a stamp set you wanted to add to your collection is gotten before it is retired. You might also want to check the current In Colors to get some additional cardstock before it is also gone forever. The last day for any of the orders is August 9Th.